The color :dark ruby which crosses into deep purple, unwise. The smell is strong, jam of black berries and dark cherry. The body is full. 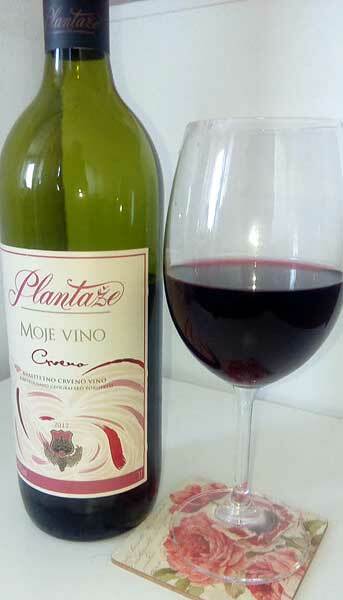 In the mouth black currant,pomegranate, blackberry, almost sweet, true Mediterranean taste. Robust,mild tannin, with no elegance . Surprisingly good balance, very drinkable. The finish is short, strong and very fruity,with a lot of nice acidic. First: this is bulk wine, but very good bulk wine. Rumor says this wine is made of those wines that the manufacturer thinks they cannot achieve the high quality which is standard to “Planataze” That is why the taste and content (mixed from 4 to 7 a kind of grape) is different every year. But this vintage has been a very good for us. Maybe the bigger amount of Sangiovese and Grenache (however,”Plantaze” has little of it only for experimental blending) given this result this year? Who knows? But the wine is a very good match for me, and I can recommend it to that category (and few nex price/quality categories) without dilemma.